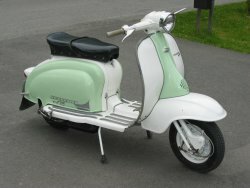 October 1969 saw the T.V 2 introduced, Innocenti marketed the scooters as "the Sportsman scooter". Styling was based on the late Li Series 1 but with a few changes. A re-worked headset, which now carried a new headlight which turned with the steering, and floor mats instead of runners were the main differences. All the T.V's now came with a dual seat as standard, with twin saddles available as an option. Mid production changes were from the early style of rear rear light as found on the TV first series, to a later taller one offering more lighting area. Again as per the first series models, early examples of the second series retained the round horn grille, with later ones switching to larger a pear shaped horn grille. Forks were retained from the first series, and fitted with colour coded from dampers. The front brake was upgraded a featured disc type links, but still with drum brakes. One interesting fact on the TV second series, was presumably with the increase in power, this highlighted a weakness with the frame. 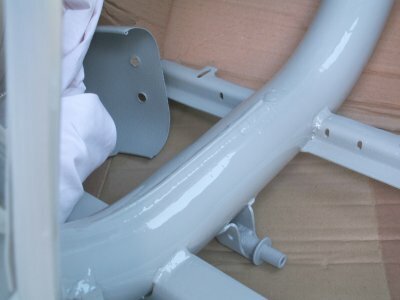 The main frame tube on some very early examples had started to crack. Innocenti recalled all models, and production line was stopped. Innocentis answer was to cut the frame in half, weld in a flat plate, and then weld the frame back together, thus improving the strength. 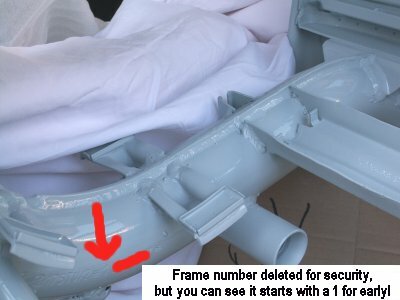 This decision looking back at it now, was very strange, it must have cost Innocenti much more money to carry out these modifications, then it would have to scrap the frames and start again. When all current frames were modified, Innocenti improved the strength of the frames by making them from thicker gauge tube. Frame numbers on the TV series two, appeared in two groups, the first version which were mainly the ones that needed the modification started with a 1, later thicker frames started with a 2. The engine now featured a 58mm stoke crankshaft, though with a 117mm rod length as apposed to 108mm on Li, along with a different barrel and piston. Gone was the troublesome kick start arrangement from the first series, to be replaced by a simple piston which engaged teeth on first gear. Carburation was again down sized to 21mm on the later ones, from 23mm on the early examples. Output was still claimed at 8.6bhp, with top speed rising to 65mph! 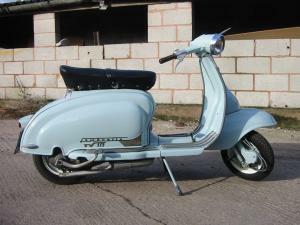 The badging on the TV wore the same long "Lambretta embellisher" as Li models, but large TV175 bolt on badges beneath. Leg shields wore a crest in the centre of the horn casting, which hid two bolts to help secure the horn casting, and badge clip. On the leg shields was fitted a thin chrome Lambretta badge, with the TV175 model badge beneath it, again chromed. UK models also gained a round brass badge, with the St Georges dragon on it. 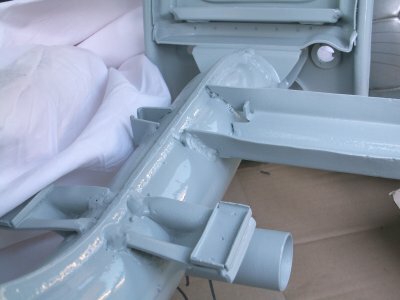 All body rubbers and trim were grey, along with the control cables, except for the following :- The stand feet and kick start rubber were black, the rear light body gasket was white. Again as with it's sister model the Li, the second series TV was some ten pounds cheaper than the series one it replaced, which helped sales against the competition. Colour options were Ivory, light blue, and some two tone yellow or grey, with the second colour of blue or red to the side panels and horn cast. By the time production stopped in November 1961 over 34,000 examples had been built. An early model frame, with the "factory" modifcation to strengthen them!